For the singleplayer fighting enthusiast, NetherReam's DC Comics sequel is best-in-class. It wasn't that surprising when Injustice 2 initially skipped a PC release. Developer NetherRealm Studios' last PC effort was Mortal Kombat X, a game with an utterly disastrous PC port at launch. Skipping the PC made some kind of sense, even if it was disappointing—and now, months later, the wait has paid off nicely, delivering a well-made version of an excellent game for PC players. This is the best launch version of any NetherRealm title, and in turn offers PC players a great experience for one of the most in-depth, content-packed fighting games ever. For the uninitiated, Injustice is what happens when you take the brutal-feeling melee of Mortal Kombat and combine it with DC's finest heroes and villains. There are thirty-six characters to toy around with, ranging from obvious picks like the Justice League crew down to lesser-known likes of Blue Beetle and Captain Cold. Every one has a range of normal and special moves that fit their depiction in the source material, based in a well-balanced combat system designed first and foremost to be played with friends either online or locally. Injustice 2 supports that well. PC fighters can be very hit-and-miss with controller and arcade stick support, and I'm familiar with all manner of stick compatibility troubles with certain games. Injustice 2 was one of the good ones: whatever stick or controller I threw at it worked without any fuss. There’s keyboard support too, but this is as seamless with a controller as it is on console, which is more than can be said for many other fighter ports. This sense of ease carries through to the rest of the port. It’s locked at 60fps which is vital for fighting games, and it ran like a dream on both a GTX 970/1080p build and a heftier GTX 1080Ti/2160p build. Ultrawide aspect ratios are fully supported, and a handy benchmark tool can auto-detect your system and judge if you’re ready for smooth online play. It’s top-notch work. Aside from its roster, the main strength of Injustice 2 isn't its core one-on-one battles but its depth of content. Where Street Fighter 5 has struggled to provide solo players with things to do, Injustice 2 has a ludicrous amount of content. There’s a lavishly produced story mode that does a significantly better job of telling a Batman vs Superman story than the movie, but that’s just scratching the surface. 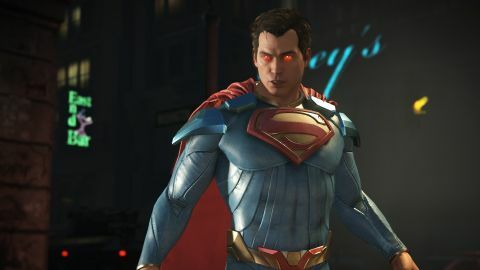 The standout solo offering is Multiverse mode, which uses DC's Infinite Crisis lore mash-up as a base for arcade mode style challenges that constantly rotate, with a variety of rewards. There’s also a full tutorial and practice mode with programmable dummies to improve your skills. Pretty much everything you do in Injustice 2 earns you some sort of reward. Experience is gained, meters fill up, and there's a constant sense of gratifying and compelling progression. Despite having a manner of loot box, Injustice 2’s console release didn't generate tons of outrage, and that’s because it's handled well. It's all about earning new gear—custom armour for each member of the cast. All gear has a unique look but also carries buffs. Some might impact stats like health or strength, while others offer bonus experience and the like. There's an enormous amount of loot catering to every DC fanboy niche, so if you want Batman Beyond Batman or classic Harley Quinn all you have to do is grind it out and earn it. Multiverse mode is very much built to enable grinding without feeling samey, too. The gear system allows you to create a nicely customised version of your character of choice that fits your play style. These stats and changes can be taken into many of Injustice 2's modes, but crucially for ranked matches all of the buffs are turned off—it becomes cosmetic gear for bragging rights only. Online was where Mortal Kombat X most grievously suffered, but it seems the lesson has been learned here. Aside from the briefest of hiccups around Multiverse, getting into a match on launch weekend has been a breeze in Injustice 2—and once in, it works fabulously. The days of waiting ten minutes for a laggy match of Mortal Kombat now feel blissfully distant. In fact, my only real criticisms are of obtuse menus, comparatively long loads and the generally grimy style of the game. NetherRealm’s deliberate, heavy-feeling combat isn't the best in the genre, either, but it fits this kind of game perfectly. They sure know how to make an accessible, fun fighting game with lots to do, no matter your skill level.